Created by Tyler Florence for Food & Wine magazine, this dish uses ricotta, beets and their greens, dill, pomegranate seeds, olive oil and sherry vinegar. 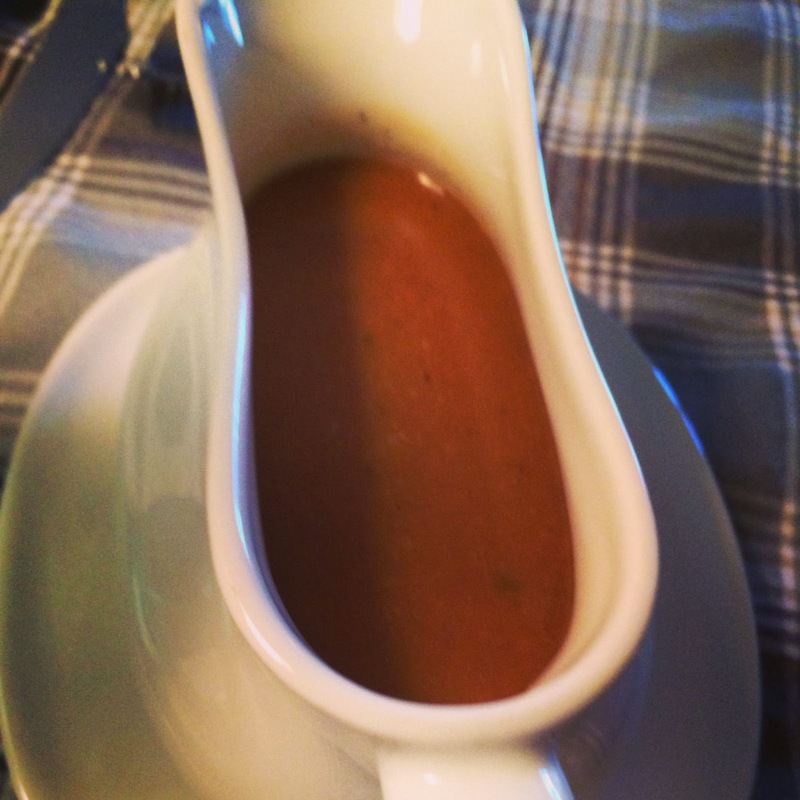 It is at once earthy and fresh, vibrant and creamy. If you can’t find beets with beautiful greens, Swiss chard or curly spinach leaves can be used instead. 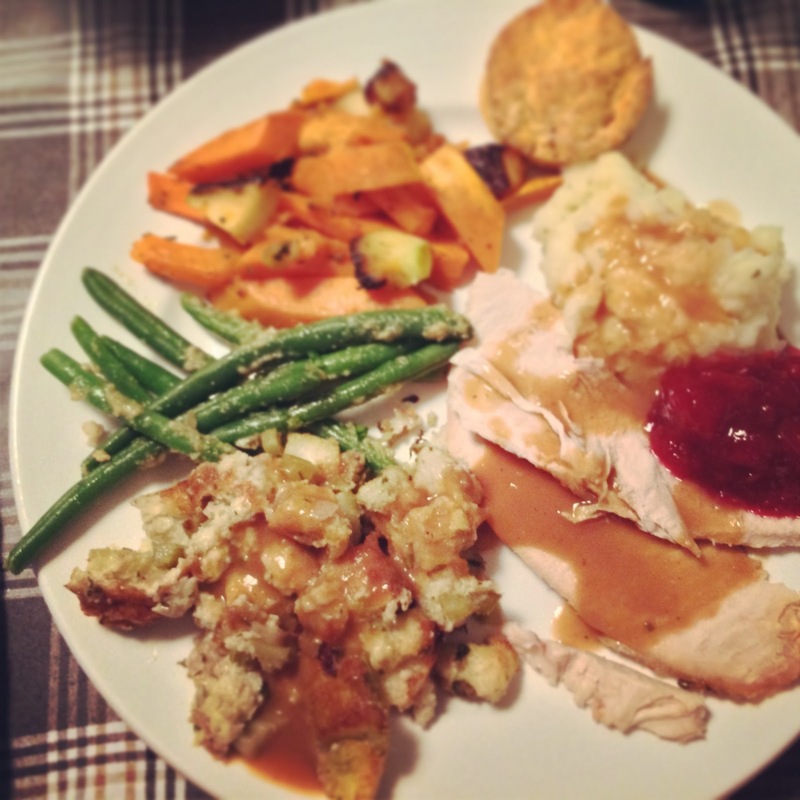 For Canadian Thanksgiving this year, I had the usually fare: turkey, stuffing, mashed potatoes, gravy, salad and vegetables. Of these, two recipes really stood out. Who knew I could bake? For this early Thanksgiving dinner I attempted a Salted Caramel Apple-Pear Tart from Fine Cooking Magazine. It looked great (if I do say so myself) and was not too arduous. This lattice-topped tart combined fall fruit with cardamom. Salted caramel tied the flavours together and large-crystal sanding sugar on the lattice added crunch. 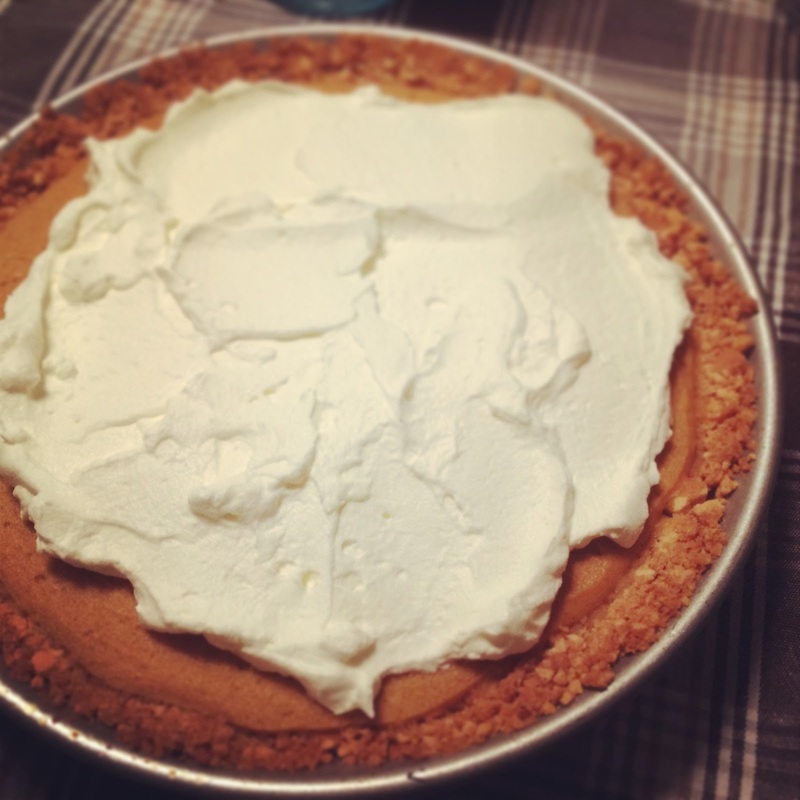 The Classic Pumpkin Pie, also from Fine Cooking Magazine, had a flaky, buttery crust and a creamy, spiced pumpkin filling. The other standout dish was the Roasted Brussel Sprouts with Caramelized Onions (again from Fine Cooking Magazine) which was flavoured with thyme and a little cider vinegar. The soft and sweet onions nestled into the tender, roasted sprouts, so you got a taste of them with every bite. I swear I’m not sponsored by Fine Cooking Magazine but I have to say that it was a nice having them by my side whilst cooking this whole feast. One down, one to go. Just finished serving up a scrumptious Canadian Thanksgiving spread and I’m gearing up to dish out American Thanksgiving in a few weeks. And there’s a common element in both of my feasts. The turkey and the cranberry sauce. 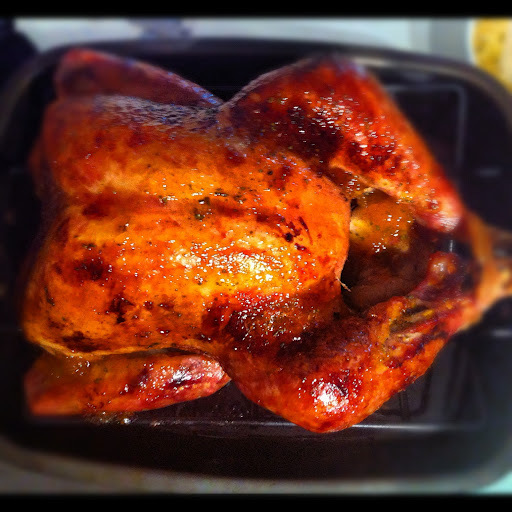 Try out Food & Wine’s Apricot-Glazed Turkey. 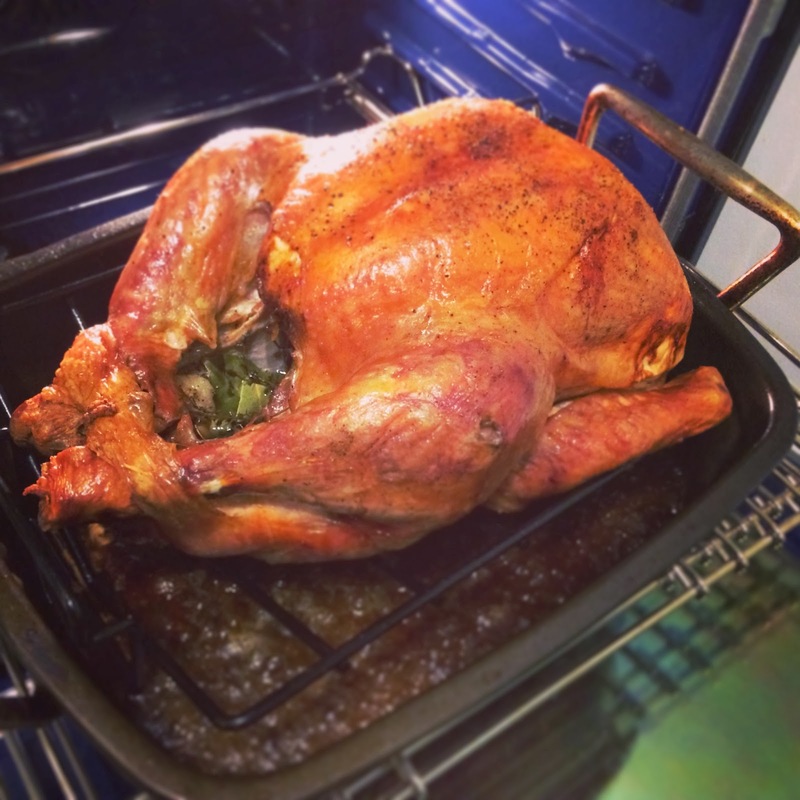 This roasted turkey tastes as good as it looks. It’s rubbed with olive oil, sprinkled with a mixture of coarse salt and pepper, and stuffed with bay leaves, lemons, garlic, thyme, roasemary and sage. The gorgeous mahogany colour comes from a glaze of lemon-infused apricot jam. The meat is flavourful and moist. And, it all cooks in less than three hours. Bon Appétit’s Cranberry Sauce with Vanilla Bean and Cardamom is a tangy and flavourful relish. Fresh cardamom and vanilla seeds make for a version that’s sweet, sultry and exotic. It’s my family and friend’s favourite. Sometimes I just need to escape to the big city. True, it comes with some headaches like snarling traffic and unruly crowds. But the benefits of being in a metropolis far outweigh the liabilities. If only to get me out of my food slump. Chipotle, Chipotle, how do I love thee? I may seem strange to profess ones love to a fast food restaurant but considering the jam-packed Yonge street location, I am not alone in my adoration of the burrito bowl. And like long-distance lovers reunited after a lengthy time apart, it was oh so sweet. I long for the day when we can once again be together. Chipotle, it wouldn’t hurt you to save me some gas money and move to my neck of the woods. I love thee but how much do you love me? No One Diets on Thanksgiving! Thanking is important. Giving is essential. That’s why Thanksgiving is just simply the perfect holiday. Not overly commercial, no need to buy gifts, the drama is at a minimum and it’s mostly about the food. And that’s the way I like it. I love Thanksgiving so much that I celebrate it twice. 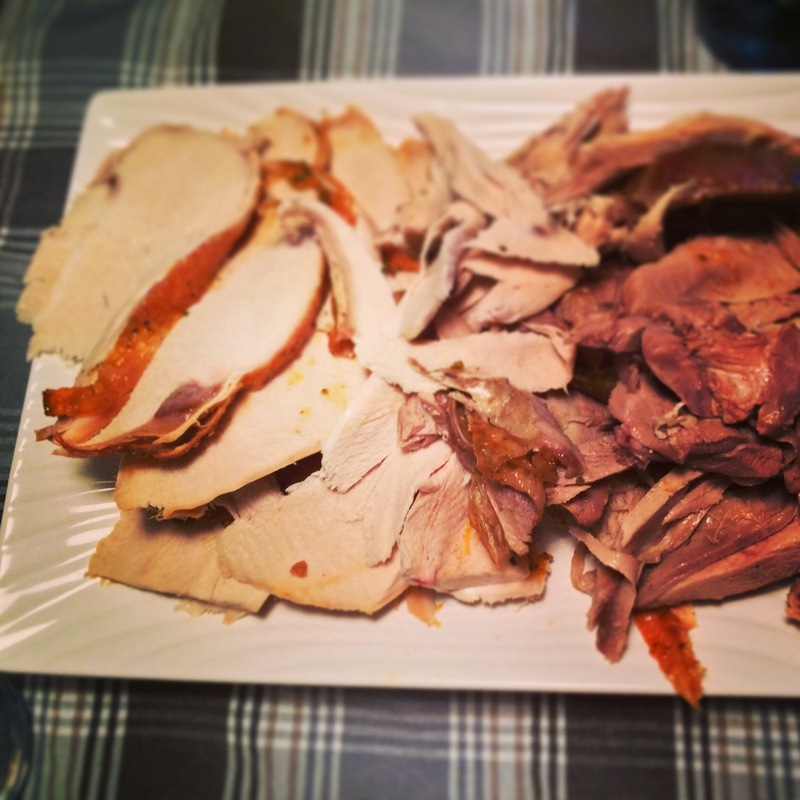 Canadian Thanksgiving in October with my family and American Thanksgiving in November with my friends. The double holiday gives me an opportunity to cook some of my favourite food and watch some football. 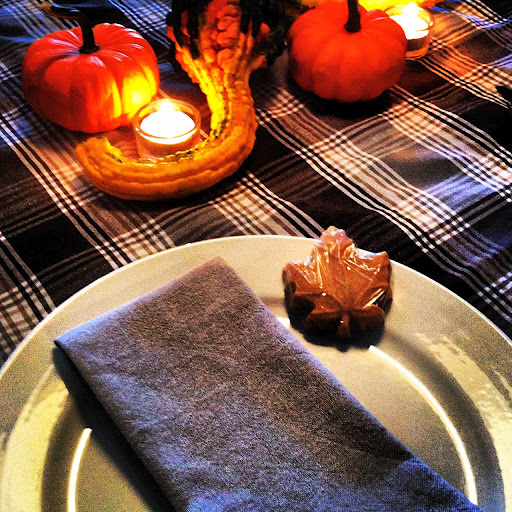 So without further ado, check out my Canadian thanksgiving family feast below! I’ve cooked many turkeys in my lifetime but I always keep coming back to this recipe from Food & Wine magazine, Apricot-Glazed Turkey with Fresh Herb Gravy. I do appreciate how delicious the bird always turns out. 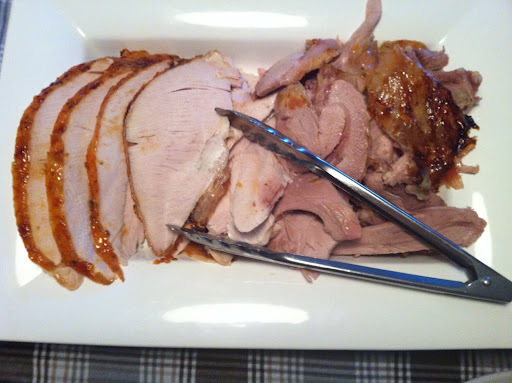 Stuff the turkey with herbs, some garlic, baste it in the last half-hour and it’s done! This next dish is my favourite. 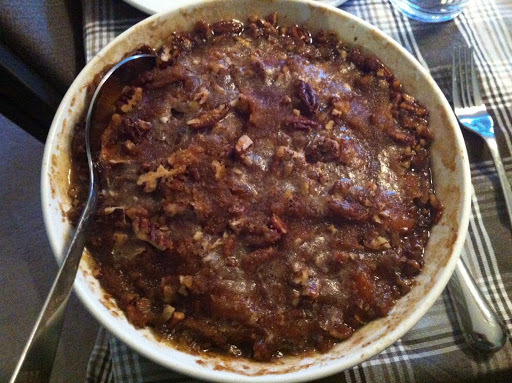 Mashed Sweet Potatoes with Brown Sugar and Pecans from Bon Appétit magazine. The secret is to whip the cooked sweet potatoes in a food processor and then top them with butter, brown sugar and pecans. So good, you don’t understand. 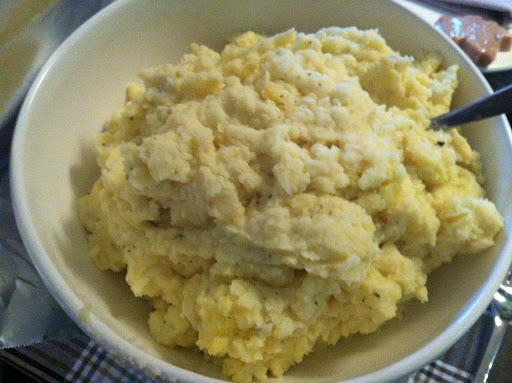 If there is a dish that I couldn’t care less about it’s mashed potatoes. Never been my favourite. 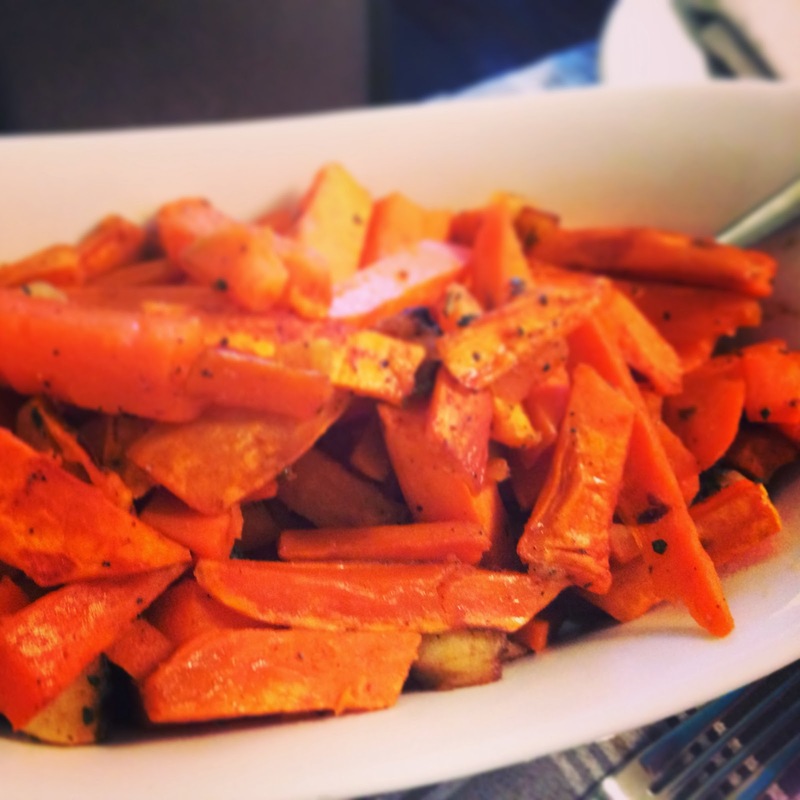 But my mom and sister covet them with such intensity that I make sure that the spuds I serve are first-class. I try and keep it simple. 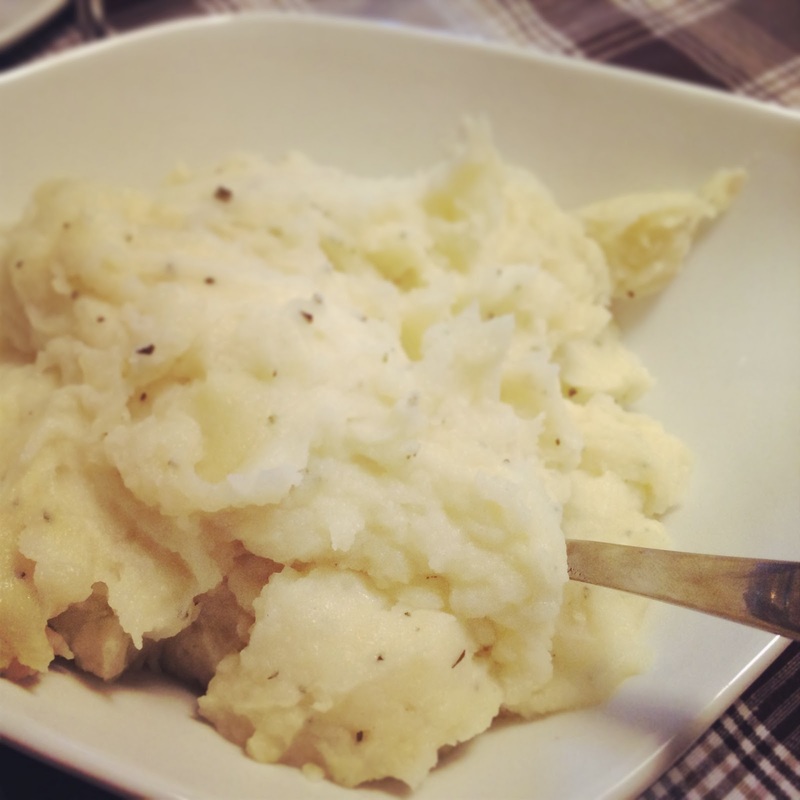 This recipe is for Rosemary Mashed Potatoes from Bon Appétit magazine. And there’s usually a healthy portion left over for take away (cause I certainly won’t be eating them). 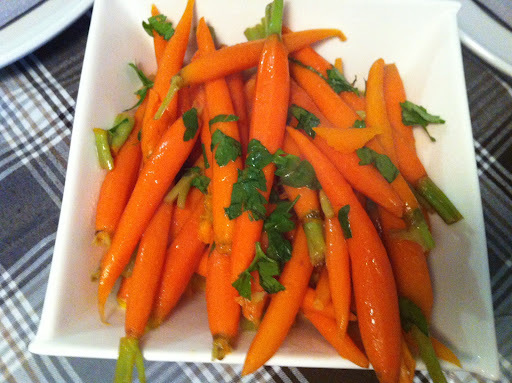 Maple- and Tangerine Glazed Carrots from (where else?) Bon Appétit magazine are easy to make. A pinch of cayenne pepper adds a little bit of a kick to them. 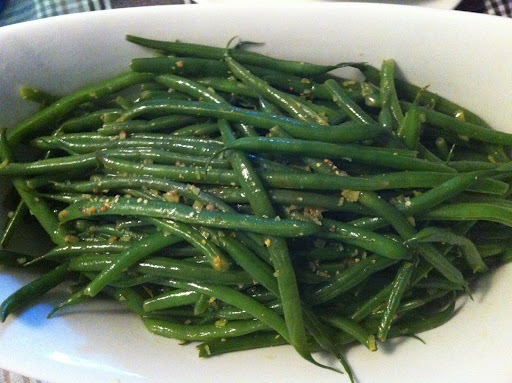 I quite liked these green beans and will probably make them again. 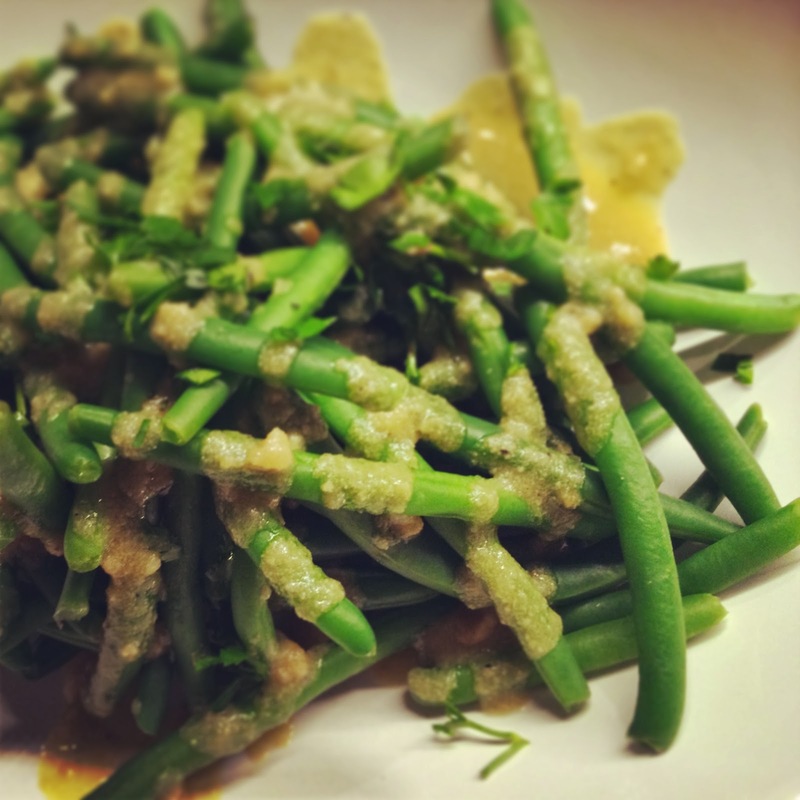 Cook the green beans and then toss them with a vinaigrette. Pretty simple. 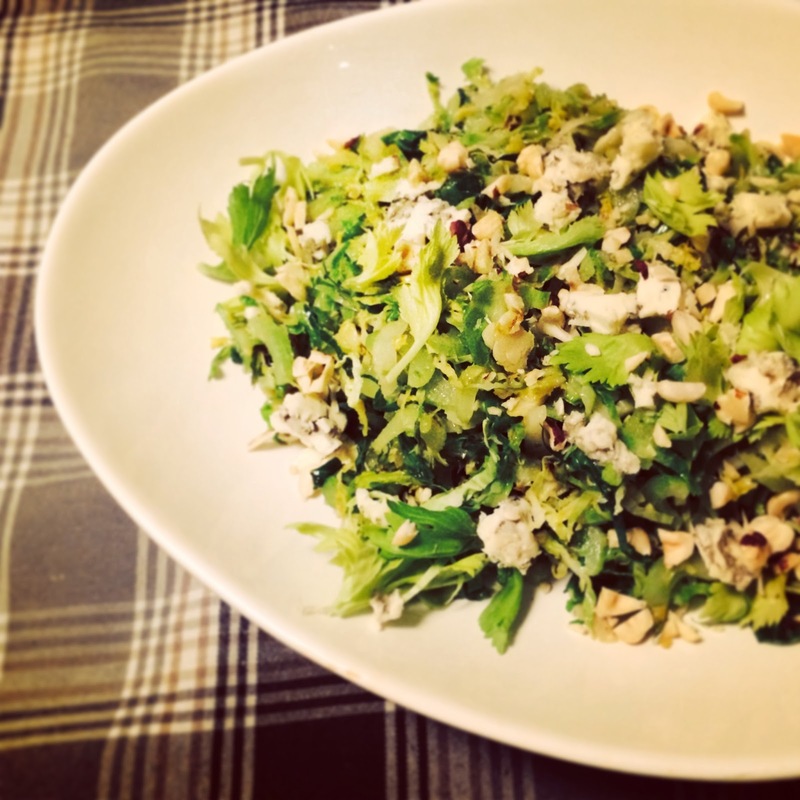 Check out the recipe for Green Beans and Walnuts with Lemon Vinaigrette. 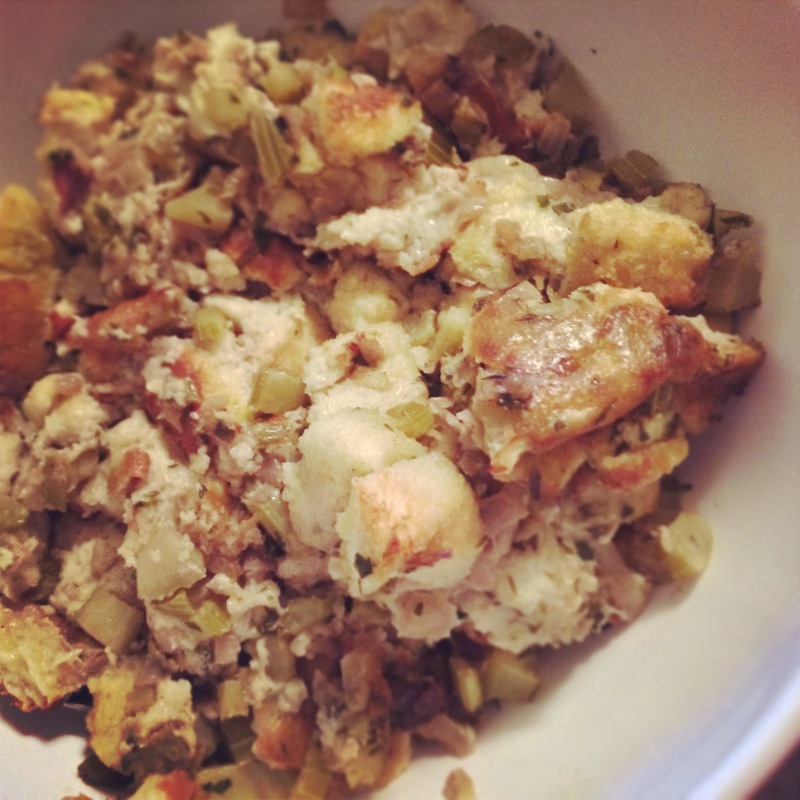 The stuffing was not the best in the world but my family enjoyed it. 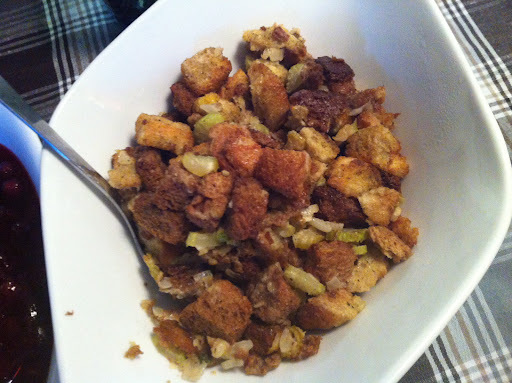 I usually make the stuffing from scratch using country bread but I ran out of time. 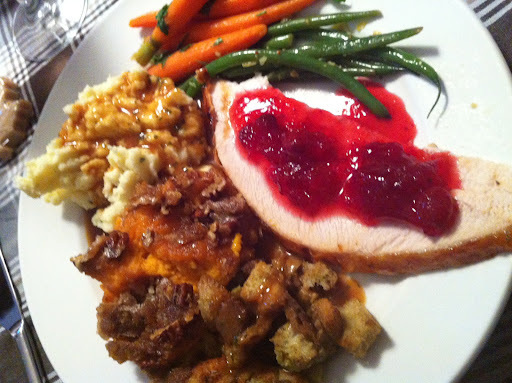 I used Marcy’s Gourmet Stuffing Mix from Costco. 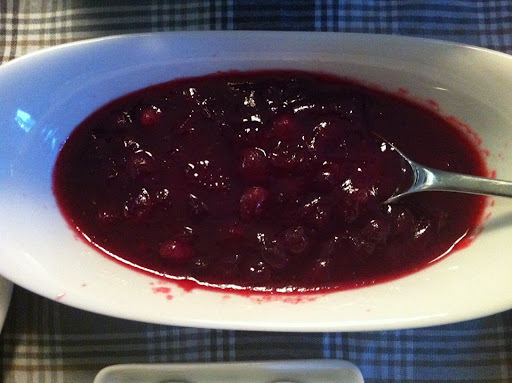 I dont eat cranberry sauce other than this one. 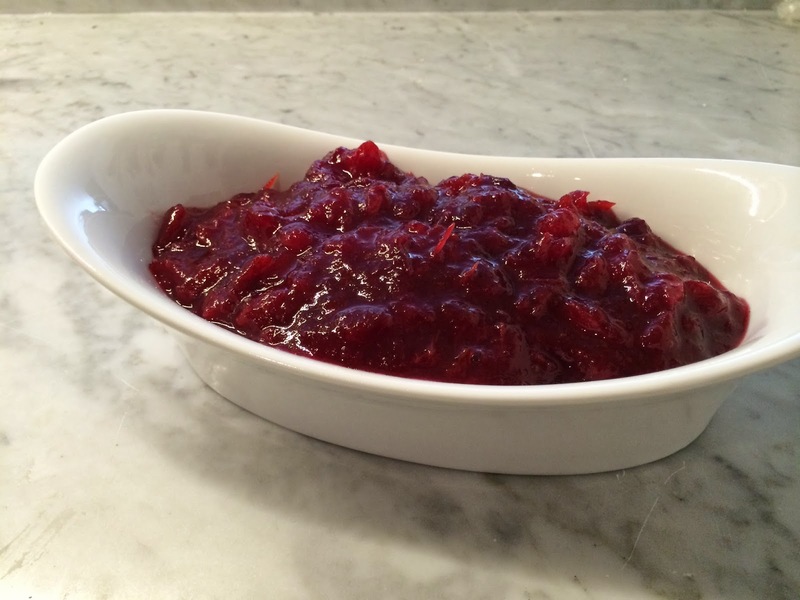 Check out the recipe for Cranberry Sauce with Vanilla Bean and Cardamom. 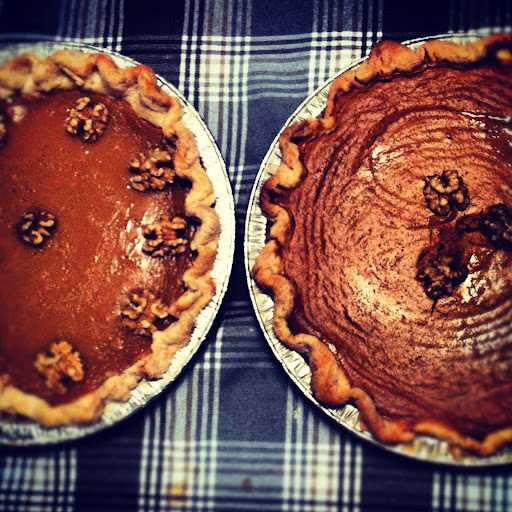 And for the finale, my mom made pies. Sugar and pumpkin. They were both delicious (as usual). 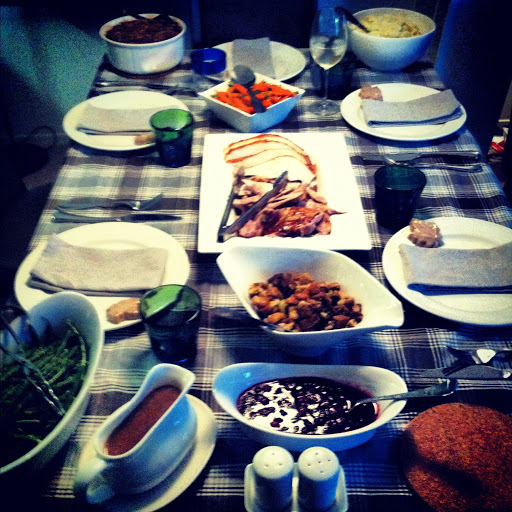 That marked the end of Canadian Thanksgiving 2012 and we were all officially stuffed. One Thanksgiving down, one more to go. And for that (and may other things), I am thankful.